Serenade is far and away Mario Lanza's most interesting movie, and has a great deal more going for it than Time Magazine and other habitual Lanza-knockers would care to admit. While undeniably flawed, the film contains moments of greatness that redeem its shortcomings, and successive viewings only enhance one's appreciation of this underrated work. Most people would nominate The Great Caruso as Mario Lanza's best movie, and certainly it's a much more consistent film than Serenade. The Great Caruso also takes far fewer risks, featuring a "safe" choice of familiar operatic standards, and a screenplay that is little more than a series of entertaining vignettes. There is no real dramatic pulse to The Great Caruso at all, with a clichéd script that leaves Lanza few opportunities to flex his acting muscles. On the positive side, Lanza is in exceptionally beautiful voice, and it is this combination of gorgeous vocalism and his charisma that holds the whole thing together so well. While The Great Caruso would probably be most Lanza aficionados' first choice as an introduction to the tenor, Serenade has so much more meat on its bones that it invariably makes the stronger impression, warts and all. "I didn't know Lanza could act!" was one friend's response to this movie. And Lanza's acting is one of the big surprises in Serenade. For aside from some superb singing, the tenor succeeds more often than not in a performance that should have been a revelation to moviegoers at the time, accustomed as they were to the tenor's fluffier cinematic vehicles. Not that he was given much credit for his efforts, with some critics preferring to comment on his appearance rather than acknowledge any real acting potential. "He looks like a colossal ravioli set on toothpicks," sneered Time Magazine in a typically mean-spirited and inaccurate review. To be objective, Lanza's acting does veer towards hamminess at times—a fault which director Anthony Mann should have corrected—but there are many scenes in which he is highly effective. Could Lanza have become an accomplished screen actor? Ludwig Donath, who played the role of Enrico's manager in The Great Caruso, certainly thought so. While acknowledging that Lanza lacked some of the fundamental aspects of screen acting, Donath felt that the tenor possessed "the warmth that one needs [to be an actor] and he loved the world of make believe." Vincent Price went further, observing that in Serenade, Lanza performed "a thorough job, a sincerely conscientious one. He's so sincere, he is almost dedicated - like a New York actor." Price's comments were high praise indeed for a man who had not acted for over three years, and was undoubtedly nervous as shooting began on location in Mexico in the late summer of 1955. 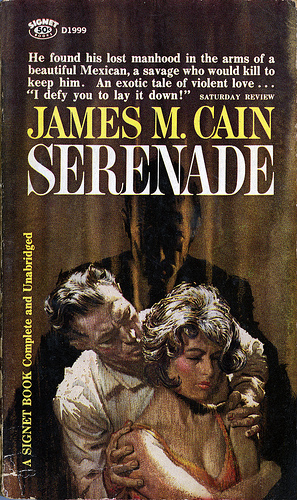 James M. Cain's Serenade must have struck observers at the time as a strange choice for the tenor. After all, the novel had gained considerable notoriety for its themes of prostitution, violence and homosexuality, and one can imagine the image-conscious Joe Pasternak, producer of Lanza's previous movies and purveyor to the masses, shuddering at the thought of his "boy" appearing in such a lurid melodrama. Warner Bros, however, were mercifully not MGM, and indeed they prided themselves on their grittier approach to film-making. It was Lanza's close friend Edmond O'Brien who apparently introduced the tenor to the novel. According to O'Brien, Mario was immediately enthused by the cinematic potential of Serenade, reasoning that the scenarists would be able to tone down some of the more controversial aspects of the novel without sacrificing its dramatic power. How well they succeeded in adapting Serenade to the screen I will discuss shortly. But enough introduction---let's go to the movie itself.